I loved these, not as good as fresh cherries but way more versatile. I used them in oatmeal, cereal, salads,etc. Great product and healthy with no artificial junk added. I thought they were pretty good, I put then in my salads instead of craisans , they are much softer . Theybhavejust the right amount of sweetness. It took three trips to the store to find these located in a basket on the bottom shelf in the produce isle. So low to the ground they might as well have been on the floor. The packages were covered in dust. I didn't realize until we opened it and tried it that they had expired. Taste was gross, chewy and stale. Not for us. These were nice, bite sized, and sweet. The texture is a little odd at first, but they grew on me. I love the all natural, nothing added part! I love dried fruit, and the thought of no added sugar sounded good, but I didn't really like this. I gave it to a friend who eats really healthy and she liked it. I don't think the 'average' person who is trying to eat healthier will like this very much. These were pretty good. The had a texture similar to raisins, but the cherry taste was pretty good. It is great for an on the go snack or as a salad toper. My favorite of all the Peeled Fruit flavors. 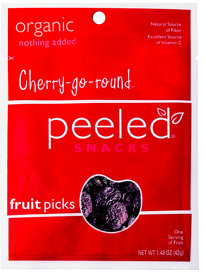 Flavorful and great for snacking. We were sad to see the last one go. Healthy and so tastey! You can't also do a lot of different things with them when baking just like rasisins.